Wedges of tortilla, filled with roasted vegetables and oozing with warm melted Manchego cheese – the sheep’s-milk variety that is a specialty of Spain; with a firm texture, distinctive, subtle piquancy; and very pleasing melting quality -- make a surprisingly elegant snack. 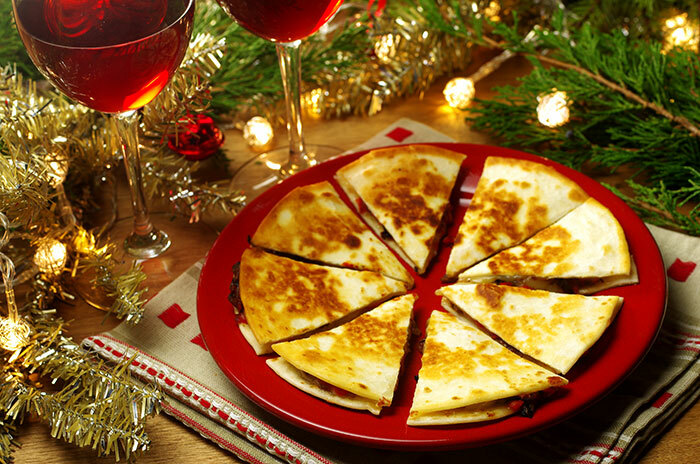 Try these quesadillas with a Spanish wine like a red Rioja or white Albariño. Put the bell peppers/capsicums and onions on a baking sheet/tray. Drizzle with the olive oil and toss to coat. Sprinkle with salt and pepper. Roast, turning once, until browned and softened on all sides, about 1 hour. Remove from the oven and set aside to cool. Chop the roasted vegetables into small dice, then transfer to a bowl and toss to mix. Heat a sauté pan over high heat. Reduce the heat to a medium and add just enough of the corn oil to coat the bottom of the pan, swirling the pan or spreading the oil with a spatula. Let the oil heat briefly, then place a tortilla in the pan and sprinkle with 1/4 cup/30 g of the cheese. Add one-fourth of the vegetable mixture, top with another 1/4 cup cheese, and cover with a second tortilla. Cover and cook until golden brown on the bottom, about 3 minutes. Turn carefully and cook until the cheese is melted and the second tortilla is golden brown, about 3 minutes longer. Repeat with the remaining tortillas, cheese, and vegetable mixture to make three more quesadillas. Let cool before cutting. Cut each into quarters and serve. Make-Ahead: The roasted peppers and onions can be made up to 1 day in advance. Store, covered tightly, in the refrigerator. Gently reheat the vegetable mixture in a sauté pan over low heat before assembling the quesadillas. Recipes from Wine Bites by Barbara Scott-Goodman. Published by Chronicle Books, San Francisco, CA. Copyright 2011. Reprinted with permission of the publisher. All rights reserved.